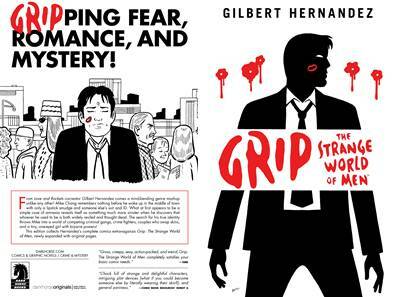 Comics luminary Gilbert Hernandez delivers a genre mash up unlike any other! When Mike Chang wakes up with nothing but a lipstick smudge, someone else's suit, and amnesia, he's thrown into a world of criminal gangs, crime fighters, skin swappers, and a one-eyed girl with bizarre powers! Collects Grip #1 - #5. Newest entry in the Gilbert Hernandez (Fatima, Love and Rockets) library! Expanded with a new cover and story pages! Hernandez has won PEN Center USA's Award for Outstanding Body of Work!